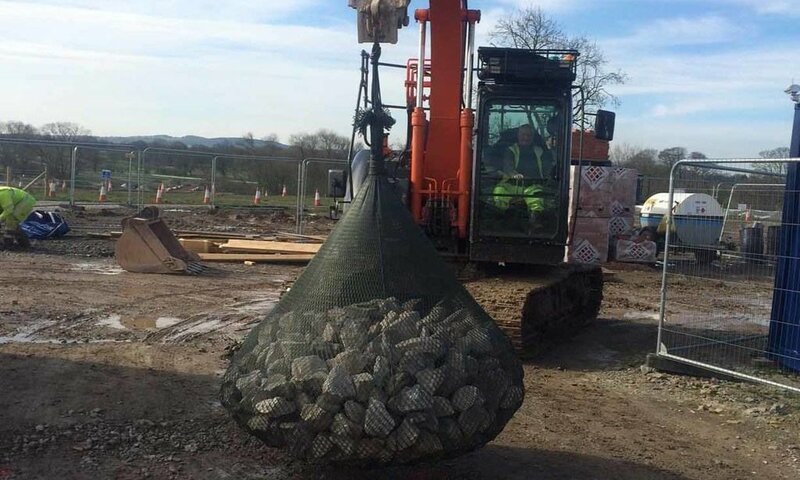 The Environment Agency along with WEM Framework contractors VBA (Volkerstevin, Boskalis & Atkins) specified 2T Kyowa Filter Units, known as Rockbags in the UK, for the large flood risk management scheme currently being constructed to reduce the flood risk to Croston Village. Located in the central west region of Lancashire, Croston Village has been flooded on many occasions with the most recent flooding event occurring during the 2015/2016 winter storms. The Environment Agency and its partners constructed a flood storage area across the River Yarrow upstream of Eccleston Bridge capable of holding back the equivalent of 520 Olympic sized swimming pools of water during a flood event. The Units were installed at the toe of the river banks that will be excavated to shape the new inlet and outlet channels to the newly constructed culvert. The culvert will hold back the flood waters and regulate the volume of water flowing towards the village reducing the flood risk of 500 properties. Known in the UK as Rockbags, Japanese company Kyowa’s Filter Units, are a simple versatile product made of mesh net and rocks. Preventing flood and bridge scour, protecting marine cable and pipeline installation, easy and cost effective to deploy in routine or emergency situations. Rockbags fit into the environment allowing plants and marine animals to live in the interstices inside the Units. Filter Unit Rockbags deployed for scour protection.